(d) Study of art conservation materials, where femtosecond pulses allow the cross-sectioning of delicate art materials with minimal damage. Traditionally, carrier dynamics is studied with ultrafast optics in which time resolution of femtosecond or better is accomplished using very short laser pulses. However, due to the diffraction limit, optic technique has limited spatial resolution and it is insufficient to spatially resolve carrier dynamics in devices or nanostructures at the nanometer length scale. In the FSU, we overcome this resolution limit by imaging photoelectrons generated by the ultrafast laser pulse at high spatial resolution with a photoemission electron microscope. The unique combination of electron microscopy with ultrafast optics provide a means to visualize electron dynamics in materials at its fundamental time and length scale. Using this technique, for the first time, we captured a video showing electron flow and charge transfer within a photovoltaic device structure. This ultrafast nanoscale imaging technique provides a unique way to investigate novel materials and quantum processes in the nano- and femto- scale where the interaction of light and matter are still poorly understood. M. K. L. Man, et al. Imaging the motion of electrons across semiconductor heterojunctions, Nat. Nanotech. 12, 36 (2017). The negatively charged nitrogen-vacancy (NV -) defect has attracted the most attention, motivated by its potential to serve as a building block for novel quantum technologies. Single-photon emission from the nitrogen-vacancy defect in diamond constitutes one of its many proposed applications. Owing to its doubly degenerate 3E electronic excited state, photons from this defect can be emitted by two optical transitions with perpendicular polarization. 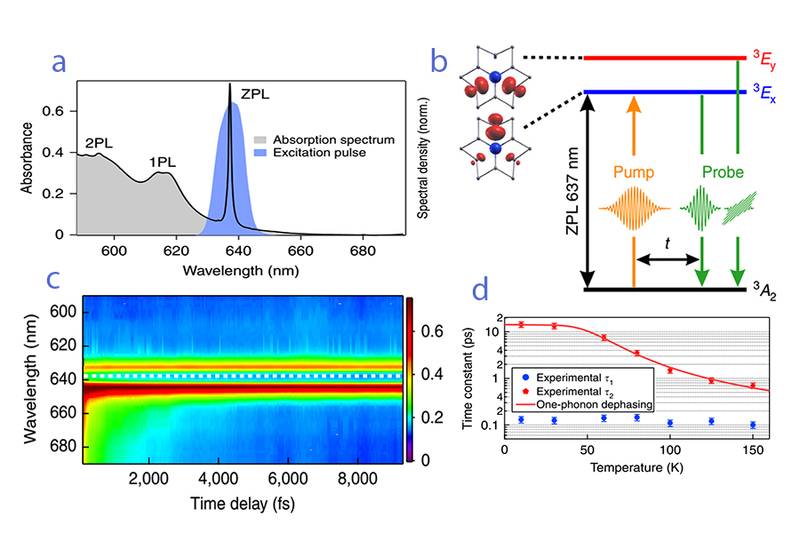 Previous measurements have indicated that orbital-selective photoexcitation does not, however, yield photoluminescence with well-defined polarizations, thus hinting at orbital-averaging dynamics even at cryogenic temperatures. Here we employ femtosecond polarization anisotropy spectroscopy to investigate the ultrafast electronic dynamics of the 3E state (Fig. 2). We observe sub-picosecond electronic dephasing dynamics even at cryogenic temperatures, up to five orders of magnitude faster than dephasing rates suggested by previous frequency- and time-domain measurements. Ab initio molecular dynamics simulations assign the ultrafast depolarization dynamics to nonadiabatic transitions and phonon-induced electronic dephasing between the two components of the 3E state. Our results provide better understanding of the ultrafast orbital averaging that exists even at cryogenic temperatures. Figure 2: Optical properties of NV- defect diamond and its ultrafast dynamics to show polarization anisotropy. a) Optical absorption spectrum of the NV- defect diamond recorded at 77 K, showing three distinct transitions. The spectrum of the pump pulse used to excite the ZPL line is shown in blue. b) Electronic structure of the NV- defect diamond, showing the 3Ex (blue) and 3Ey (red)components of the 3E state accessed from the 3A2 ground state via the ZPL transition with 637 nm c) Time evolution of the polarization anisotropy spectrum recorded at 77 K after ZPL excitation d) Temperature dependence of t1 and t2. R. Ulbricht, et al. Jahn-Teller-induced femtosecond electronic depolarization dynamics of the nitrogen-vacancy defect in diamond, Nat. Commun. 7, 13510 (2016). Since the isolation of graphene, there has been a tremendous interest in the exfoliation and subsequent stacking of van der Waals (vdW) materials – crystals that have strong in-plane covalent bonds in two-dimensional (2D) sheets but weak out-of-plane vdW bonding between sheets [1,2]. Monolayers of vdW materials lack dangling bonds, which enables the stacking of different layers to form vdW heterostructures without the rigorous requirements of traditional epitaxial growth methods. Recently, mixed-dimensional vdW heterojunctions, which are fabricated from 2D materials stacked with materials of different dimensionalities, have been of growing interest due to the possibility of assembling hybrid materials with novel functionalities . Of particular interest are heterostructures between semiconducting transition metal dichalcogenides and organic semiconductors, which can serve as type-II photovoltaic heterojunctions due to the large absorption cross-sections of the individual materials [4-6]. However, although these novel organic-2D vdW heterojunctions have large absorption coefficients, their photovoltaic efficiency is still very low – less than 1% -due to restrictions on the physical thickness of both materials. In this work, we employed plasmonic metasurfaces to enhance the absorption and charge photogeneration within a physically thin organic-2D vdW heterojunction (Figure 3). Plasmonic nanostructures and metasurfaces have been shown to increase absorption in ultrathin films and 2D semiconductors, and thus are good candidates for improving absorption in vdW heterojunctions [7-9]. We investigated the ultrafast charge transfer dynamics between an organic polymer:fullerene blend and large-area chemical vapor deposition (CVD)-grown monolayer MoS2 using transient pump-probe reflectometry. With the plasmonic metasurface, the charge photogeneration within the polymer was enhanced 6-fold, and the total active layer absorption bandwidth was increased by 90 nm relative to the polymer:fullerene blend alone. In the FSU, we demonstrated, for the first time, that photoinduced charge transfer from MoS2 to an organic semiconducting polymer occurs at ultrafast (< 100 fs) time scales, and that this charge transfer facilitates the significant enhancement in charge carrier density within the organic semiconducting polymer in the presence of the plasmonic metasurface. 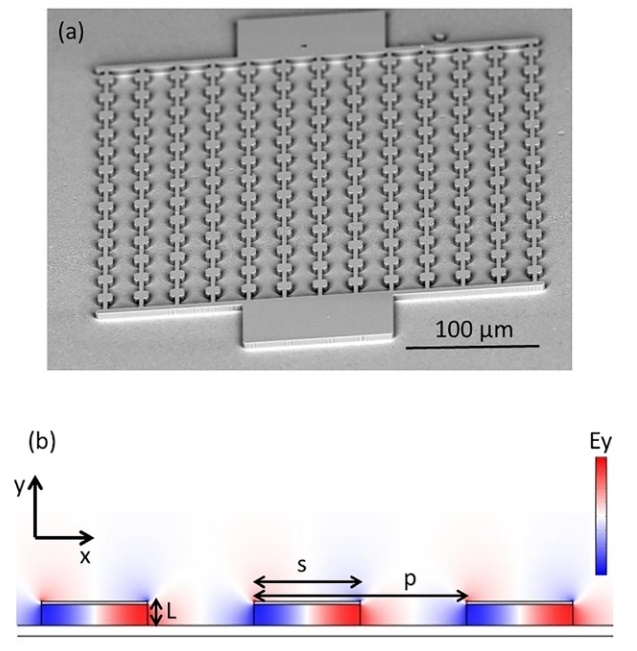 Figure 3: Schematic of organic (P3HT:PCBM) - MoS2 van der Waals heterojunction on a plasmonic metasurface fabricated from a Ag nanoparticle array on a Ag thin-film. A. K. Geim and I. V. Grigorieva Van der Waals Heterostructures, Nature 499, 419 (2013). Liu, Y., et al. Van der Waals Heterostructures and Devices, Nature Reviews Materials 1, 16042 (2016). Jariwala, D., et al. Mixed-Dimensional van der Waals Heterostructures, Nature Materials 16, 170 (2017). Homan, S. B., et al. Ultrafast Exciton Dissociation and Long-Lived Charge Separation in a Photovoltaic Pentacene-MoS2 van der Waals Heterojunction, Nano Lett. 17, 164 (2017). Liu, F., et al. Van der Waals p-n Junction Based on an Organic-Inorganic Heterostructure, Adv. Funct. Mater. 25, 5865 (2015). Shastry, T. A., et al. Mutual Photoluminescence Quenching and Photovoltaic Effect in Large-Area Single-Layer MoS2-Polymer Heterojunctions, ACS Nano 10, 10573 (2016). Petoukhoff, C. E., et al. Plasmonic Electrodes for Bulk-Heterojunction Organic Photovoltaics: A Review, J. Photon. Energy 5, 057002 (2015). Pandey, A. K., et al. Nanostructured, Active Organic-Metal Junctions for Highly Efficient Charge Generation and Extraction in Polymer-Fullerene Solar Cells, Adv. Mater. 24, 1055 (2012). Jariwala, D., et al. Near-Unity Absorption in van der Waals Semiconductors for Ultrathin Optoelectronics, Nano Lett. 16, 5482 (2016). Realizing efficient sources and detectors at terahertz (THz) frequencies is of importance as this opens the way to a wide range of potential applications such as molecular spectroscopy, imaging, security scanning and investigation of low energy physical and chemical interactions . In previous fiscal years, the unit has demonstrated semiconductor-based THz sources based on ultrafast laser excitation for spectroscopic applications [2,3]. In FY2016, we have investigated electrically injected THz sources based on quantum cascade (QC) active regions  and studied the enhancement of THz electroluminescence in the microcavity regime. In particular, we have investigated THz emission from arrays of antenna-coupled microcavities also called patch antenna microcavities and explored the effect of strong subwavelength electromagnetic confinement combined with the array geometry . Figure 4: (a) SEM picture of a fabricated device (b) Electromagnetic simulation showing the field distribution of the TM confined modes for s= 11 µm. Patch antenna microcavities are metal-semiconductor-metal subwavelength resonators structures in square shapes. The length s of the resonator defines the resonant frequency of the resonator via s=l/2n, with the refractive index of the mode. In addition, these microcavities are vertical emitters as they emit as patch antennas. We have studied the emission of samples by varying the distance d between resonators composing the array, the active region thickness (4.5 THz QC active region) and the length s of the resonators (Fig. 4). At fixed period of the array, a clear enhancement was observed for s=11 µm, corresponding to the resonator resonant frequency being in resonance with the QC electronic radiative transition, a signature of Purcell effect. By measuring the emission with d ranging from 5 to 40 µm and L=2 and 4 µm, we observed up to 44-fold enhancement of spontaneous emission compared to a reference sample consisting of a large etched mesa (Fig.5). Figure 5: (a) SEM picture of a fabricated device (b) Electromagnetic simulation showing the field distribution of the TM confined modes for s= 11 µm. By comparing our experimental with finite element simulations and antenna theory, we extract record Purcell factors in the THz range of 65 and high photon out-coupling efficiencies larger than 60%. Furthermore, our results show that the quality factor of the array increases linearly with the distance d between resonators directly impacting the Purcell factor and photon out-coupling. Our work opens the way to achieve efficient surface emitting THz quantum cascade lasers and devices based on optical nonlinearities such intracavity difference frequency or second harmonic generation. R. Kohler, et al. Terahertz semiconductor-heterostucture laser, Nature 4, 156-159 (2002). J. Madéo, et al. Patch antenna microcavity terahertz sources with enhanced emission, Appl. Phys. Lett. 109, 141103 (2016). During FY16, the Femtosecond Spectroscopy Unit has continued their work with the Wickens Unit at OIST to explore the use of femtosecond pulses in stimulating and interacting with neurons via the on-demand release of neurochemicals from liposomes. Previous experiments [Ref] demonstrated the ability to release dopamine and other chemicals on demand from liposomes packed with the chemical by stimulating with a femtosecond laser pulse train. In FY16, this work was extended to demonstrating the release of a wide range of chemicals, including inhibitory and excitatory neurochemicals, as well as synthetic analogs of naturally occurring chemicals. Furthermore, these releases were shown to evoke sub and supra changes in membrane potential in live brain slices, bringing the technique closer to in vivo studies in mice, and corresponding applications. We showed that the responses were repeatable and could be controlled by adjusting laser stimulation characteristics. In particular, we demonstrated the release of a synthetic receptor-specific agonist that exerts physiological effects on long-term synaptic plasticity. Lastly, we also demonstrated that the loaded liposomal nanostructures can remain functional in a live mouse for long periods – upto several days or weeks. Figure 6: Schematic illustrations and optical images of the paint sample 1 which is cut by (a) a scalpel, (b) CW laser, and (c) femtosecond laser. The laser beams are focused onto the sample through a 10× objective lens. The black scale bar is 200 μm. Over the past decade, it has been shown that ultrafast lasers provide the ability to machine metals and dielectrics with high precision and minimal thermal damage, due to their high peak powers and short pulse durations. In FY16, using this broad concept of machining with femtosecond lasers, the Femtosecond Spectroscopy Unit, in collaboration with the Art Conservation Program at OIST, and the Art Conservation Department at Buffalo State University studied a novel application to art materials - obtaining cross-sections of fragile, combustible paint layers in artwork and cultural heritage property. In general, cross-sections of paint and other decorative layers on artwork are essential to study art work and obtain useful information including fundamental knowledge about the materials used, the stratigraphy of the original and restored layers, and the history and authenticity of the art. However, current techniques to obtain cross-sections use scalpels, which can cause further damage to the artwork during the process of obtaining the cross-section, (such as crumbling, delamination, and paint compression), due to the pressure applied during a scalpel cut. Laser cutting offers an interesting alternative where one would not have to apply additional pressure while obtaining a cross-section. However, typical lasers, such as continuous-wave (CW) or nanosecond pulsed lasers can cause oxidative damage to combustible artwork. In this collaboration, we demonstrated that femtosecond pulsed lasers allow one to make controlled cross-sections of paint layers, with minimal to no damage to the surrounding artwork. The femtosecond laser cutting can avoid problems such as fragile paint disintegrating under scalpel pressure, or oxidation by the CW laser. By varying the laser power and translational speed of the laser over the art work during the cutting process, we noted different benefits for cross-section sampling. In general, our work on the use of femtosecond lasers in studying artwork presents new possibilities in analyzing, sampling, and cleaning of artwork with minimal destructive effects. T. Harada, et al. Obtaining cross-sections of paint layers in cultural artifacts using femtosecond pulsed lasers, Materials 10, 107 (2017). Dani, K. M., Man, M. K. L., Deckoff-Jones, S., Harada, T., Wong, E., Margiolakis, A., Mariserla, B. M. K., Madeo, J., Winchester, A., Lei, S., Vajtai, R., Ajayan, P. M. Time Resolved Photoemission Electron Microscopy of Nanoscale Semiconductor Heterojunctions, Invited Talk, TERAMETANANO-2016, Cartagena, Colombia, Apr 03-10 (2016). 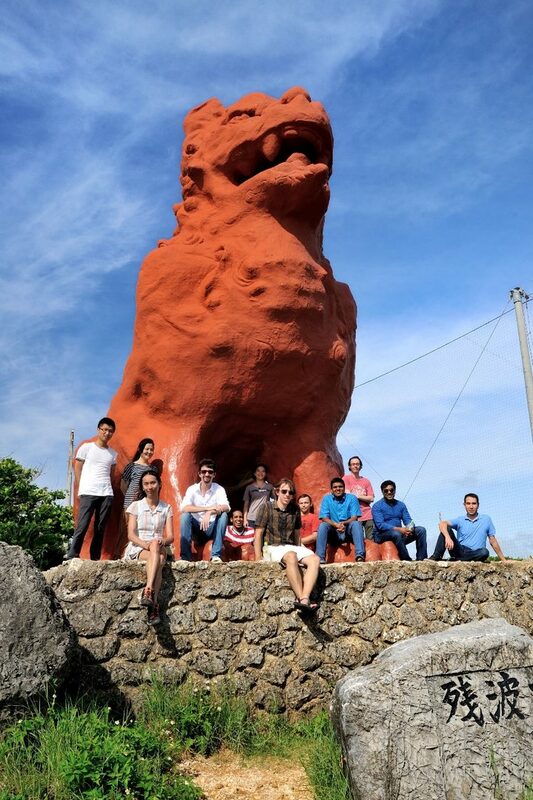 Madeo, J., Deckoff-Jones, S., Zhang, J., Petoukhoff, C., Man, M. K. L., Lei, S., Vajtai, R., Ajayan, P. M., Talbayev, D., Dani, K. M. Observing the interplay between surface and bulk optical nonlinearities in thin van der Waals crystals, Oral Presentation, CLEO2016, San Jose, CA USA Jun 05-10 (2016). Harada, T., Berggren, B. S., Deckoff-Jones, S., Renaud, D., Winchester, A., Madeo, J., Hu, J., Liu, X., Mao, Z., Wei, J., Talbayev, D., Weber, C., Dani, K. M. Nonlinear Optical Responses of Protected Atomically Thin Black Phosphorus, Oral Presentation, CLEO2016, San Jose, CA, USA Jun 05-10 (2016). Madeo, J., Todorov, Y., Gilman, A., Frucci, G., Li, L., Linfield, E., Sirtori, C., Dani, K. M. Patch antenna microcavities terahertz sources with enhanced emission, Oral Presentation, CLEO2016, San Jose, CA, USA Jun 05-10 (2016). Man, M. K. L. Ultrafast and Nonlinear Dynamics in 2D Materials and their heterostructures, Oral Presentation, CIMTEC 2016, Perugia, Italy, Jun 05-09 (2016).